You make better electricity buying decisions when you’re better informed. 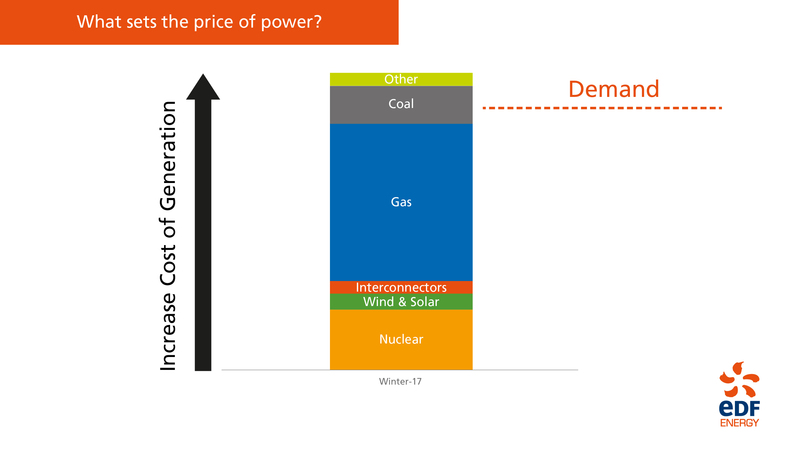 So here’s a quick run-through of the factors that influence the wholesale price of power – what they are, how they work and what to look for. You see, the wholesale price of power is one of the largest components of your overall energy cost. But it changes all the time. So let’s look at what the drivers of the power price are by answering four basic questions. What influences the wholesale price of energy? Supply and demand impact the price, with both having to be balanced every half hour by the National Grid. Put simply: there’ll be more demand for energy in late afternoon than the middle of the night; and more demand in winter than in summer. And like anything, a higher demand means a higher price. Lots of other factors impact the price of power, too. Like the price of gas, oil, carbon and coal. Then there’s the weather, currency movements, political events, even shipping prices! All of these interconnected changes affect the power price. It’s helpful to note that you can track the wholesale price of energy on our Market Insight portal. Here’s just one example of how interconnected prices affect our power price. Oil prices affect gas prices because many gas contracts are indexed to the price of oil. So, as gas is one of the main sources we generate our power from in the UK, an increase in the oil price has a knock-on effect on the power price. So, where do we generate our power from in the UK? In the UK, we generate our power from a range of sources. The country’s energy mix comes from reliable nuclear, some renewables (that’s wind and solar), some imported supply, and then gas and coal. In fact, as you can see in the chart, during winter 2017, around 40% of the power we used in the UK was from gas. Gas is also important because it can help us flex supply to meet demand. By this, I mean that on days when there’s little sun or wind, so less renewable energy, we can ramp up the amount of energy made from gas – and coal – to help boost supply and stabilise the power price. What sets the price of power? The price you pay for your power is set by the marginal generation unit. 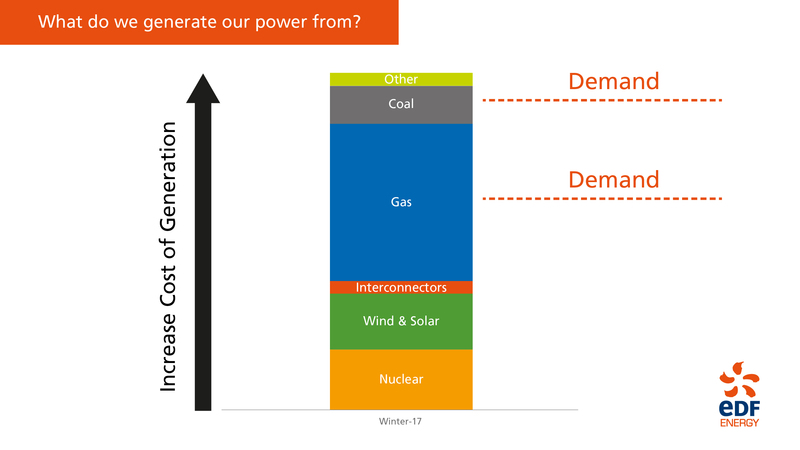 By this we mean whatever type of power, from whatever source, met the peak demand. For example, the type of power may have been coal, which is more expensive, or gas, which is cheaper. Looking at the UK’s energy mix again, you can see that, most of the time, it’s going to be gas that’s the price setter. That’s why power prices follow the gas market so closely. But it’s also important to see the amount of energy we get from other sources can shift - and change the generation unit that meets peak demand on any given day. For example, a surge in demand or a drop in wind generation can cause a shift at the last minute from cheaper gas-fired generation to more expensive coal. And so it’ll be coal-fired generation that sets the price. 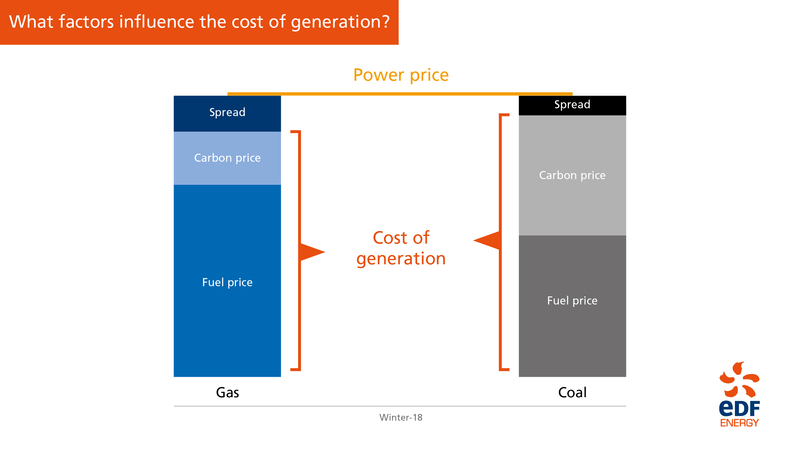 What factors can influence the cost of generating our energy? Okay. There are two parts to the cost of generating our energy from coal and gas. Firstly, there’s the cost of the fuel to generate the power. As we mentioned, this is impacted by internal factors – like supply and demand in the UK and global markets; as well as external factors – like the weather, commodity prices, currency values, and politics. And secondly, for every tonne of carbon produced by generating energy, there are two carbon charges. One is the UK carbon tax, which stays fairly constant. And the other is a carbon allowance purchased at a price that’s determined by the European carbon market, which can fluctuate. Where does the UK’s gas come from? The UK buys gas from a range of different sources, so therefore the price and volatility differs. The North Sea remains the largest and cheapest source. Then we are reliant on the European markets for imports – and here, again, the prices are affected by global factors like currency rates, shipping prices and even politics. And then there’s liquid natural gas, shipped from around the globe. 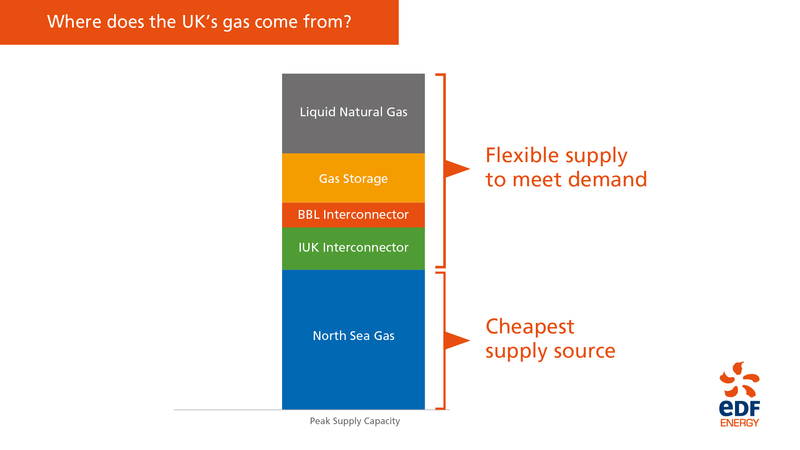 The UK has access to significant gas supply capacity, as you can see in the supply stack above. When demand increases, each of the flexible sources could contribute to meet increased demand, depending on the price and availability of each source. For example we have the capacity to provide up to 150 MCM from liquid natural gas per day, but we would only use a fraction of this to help meet the overall demand for gas. Put simply, we don't usually use the full gas capacity we have available, but its there if needed - although with additional cost. So when demand goes up and we use more of our available gas capacity, so does the price of gas. For instance, as you can see in the chart, there is ample supply capacity from liquid natural gas, however large parts of this is unavailable due to global competition. Additionally, imported gas will be reliant on continental market dynamics, whilst storage gas supply capacity is determined by how much gas is left in storage. How is the changing supply mix going to impact the market? Gradually, we’ve increased the amount of energy we get from renewable sources. Looking at installed generation capacity in the UK, we can see a significant swing away from coal-fired generation towards more renewables and imports. In 2012, only 16% of installed capacity was from renewables. Last year, that increased to 37%. Looking ahead, we forecast that’ll rise still further to 44%. However it’s worth noting the renewable generation has lower output vs its capacity. This means that although a wind farm could have the capacity to produce 500MW, it will often only produce a percentage of this, depending on the weather conditions on that day. So although renewables will make up 44% of capacity in 2022, annual output from renewable sources will be lower than this. This shift towards renewables is being driven by the low carbon agenda shared by government and businesses alike, as well as incentives, consumer pressure and reputational considerations. It’s being reinforced, too, by the requirement to pay carbon tax in the UK and buy a carbon allowance in Europe, which is making coal- and gas-fired generation more expensive. However, renewables – like solar and wind – are, by their nature, intermittent and so cannot be totally relied on. In addition, imports are dependent on the interconnected factors that affect the European and global market. 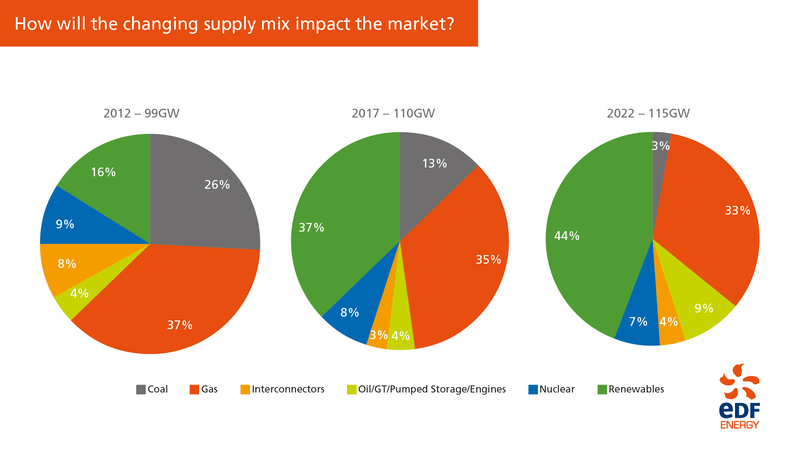 So, it’ll be increasingly important to understand, and track, how an increase in renewable generation capacity can impact the wholesale price of energy. 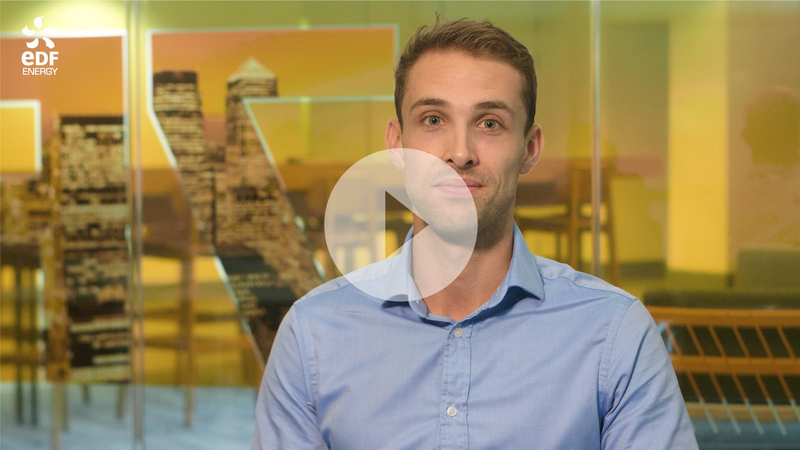 How can you stay on top of the wholesale energy price as it changes? Energy is a complex business but, hopefully, we’ve made it a bit simpler. Now that you know how it works, you can keep informed on the changing prices through us at EDF Energy. As we’ve noted throughout, you can follow the daily shifts in power prices online at Market Insight, where our experts share their views - and you can sign up to our webinars to keep updated on trends and issues, too.